TeachersFirst offers this model for elementary (or middle) schools to build skills in reading, writing, speaking, and listening systematically in a schoolwide model including students, teachers, and parents. The free web 2.0 tools suggested here are by no means the only tools that might work. These exemplary tools were chosen by the TeachersFirst Editors for ease of use and versatility in classroom and home use, and could easily be implemented at grade levels other than those suggested here. As students and teachers master a new tool at each grade level, they develop rich literacy skills and vital technology skills, all in the context of reading, writing, speaking and listening across the curriculum. Right-click here and SAVE AS to download a customizable student/parent permission form (Word doc) for use of these web 2.0 tools in elementary. The school is a community of learners, both children and adults, including parents. At each grade level, students learn one new tool and use it repeatedly as part of their literacy toolbox, not as a focus in itself. Students carry literacy tool expertise with them from grade to grade, so higher grades have more tools available. Move-ins have classmates available for support with literacy learning tools from prior years. Student tool expertise creates literacy peer-tutors, big-buddies/little buddies, and help for all teachers. Opportunities to use literacy templates and scaffolding assure success for all, while creative options allow for enrichment and extension. No teacher must learn more than one tool per year unless he/she wishes to. Both students and teachers become local “experts” on use of specific, free web-based tools and can support each other in literacy uses of these tools. Grade level teachers have the option to use a second, additional tool for teacher-created products once comfortable with the STUDENT tool for his/her grade level. 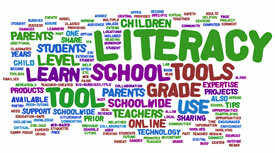 Whole-class literacy projects from previous years often remain online for future classes to see, improve, and augment. Past students can visit to comment and connect back to their own prior knowledge. Parents are invited and encouraged to learn the grade level tool at a grade-level evening literacy workshop together with their child (child teaches parent!). Parents with multiple children will only need to learn it once. Schoolwide literacy model means that families can share both in and out of school; siblings and relatives can share, as well. Parents learn along with their children. Central school locations (library/media center, computer lab) offer “centers” for tips and how-tos on schoolwide tools. School web page can share Quickstart guides and tips for schoolwide tools. Schoolwide technology use also promotes digital citizenship such as citing sources, commenting etiquette, online safety, and a critical eye toward online information. Schoolwide technology literacy also provides opportunities to extend collaboration outside the school via education-safe communities and collaborative projects with other schools using the same tools. Online sharing offers chances for “virtual” school literacy events involving parents: book fairs, poetry reading, science project sharing, etc., helping busy parents be involved with school on their own time and providing a real audience for student products.